The trees are getting naked, the autumn leaves are falling and dancing in the wind. It's about the time to say goodbye to Fall. This season, I've carried out some waste free activities using natural materials with our buddies. 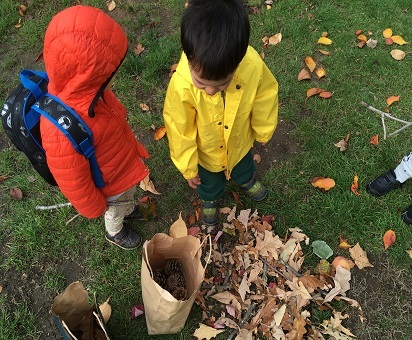 One day, we went outside to pick up "Monster leaves." "Let's find the big one!" "Look! 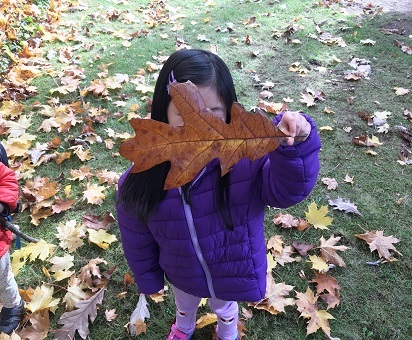 I found a big monster leaf!" "It's fun!" 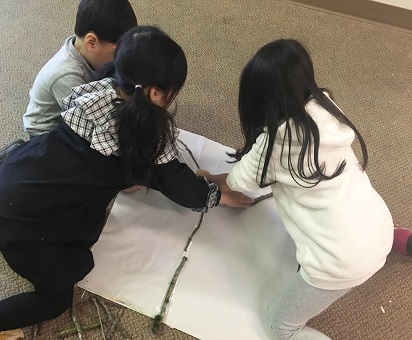 After returning to Buddings, I told them that there are lines on the leaf to transport water within the leaf. 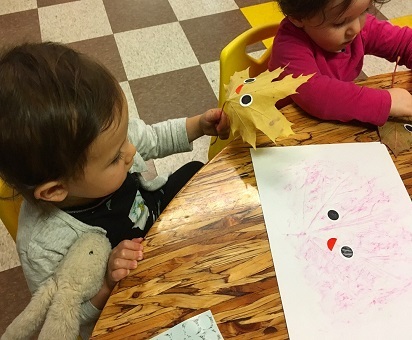 To see them clearly, I've introduced them to leaf rubbings! 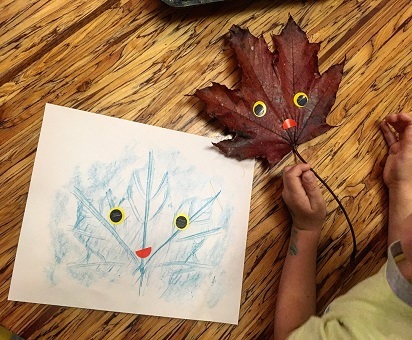 Choose a favourite leaf and place it under a paper, and colour the paper with the side of crayons. And place the eyes and mouth stickers on it. 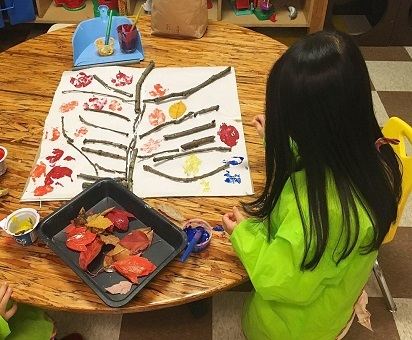 "We made a leaf monster for Halloween!" Then I told them that we don't need to buy new items to have fun! A lot of kinds of Materials are around us. "This leaf is too dry. Can I have another leaf, please?" Excellent! Sounds like it's not so special request from kids. But actually, it's a good learning process. 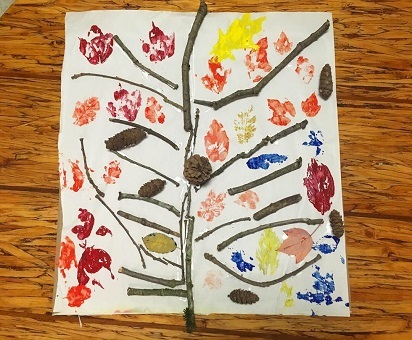 The leaf was too dry for her to paint and just collapsed. And in that situation, she could cry because it didn't go well. She could even yell like "I can't do this!" but she didn't. She found out a solution instead, which is asking a teacher a new leaf. If we can approach problems in various perspectives, and build flexible thinking like her, it will make our life much easier and happier. There are no exact same natural materials in shapes, sizes, colours, and on this occasion, leaves' dryness. Some materials would work in a particular crafting, but some don't. 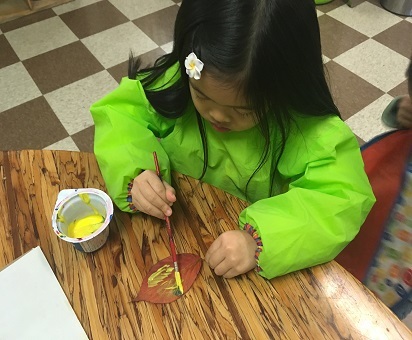 Kids may feel like failure what they've done, just because the leaf they picked doesn't work for painting. 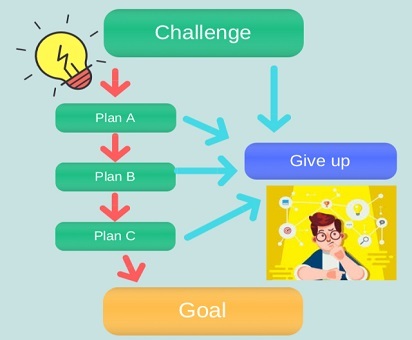 However, with various perspectives, they won't give up and they would figure out other ways to go through the difficulties. I believe through this activity, they tried things in many ways and learn how to take up the challenges! Children's brains are like sponges, soaking up huge amounts of information from their environment. That's why giving a lot of kinds of experience in childhood is very important for children's life. 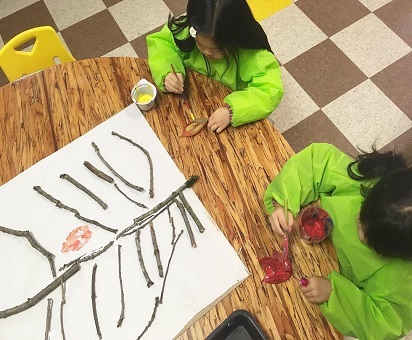 It helps to build their creativity, flexibility, and patience as well. We have more new experience ideas, and provide them through our Winter season Big Kids Club! Thank you so much for joining my Awesome Autumn BKC!